My daughter Sofia has been home from daycare for the past couple days with a fever. While walking to the pharmacy this morning, I was crossing a busy downtown street with Sofia in the stroller and my dog in tow. I waited about 20 seconds for a small gap in the traffic before I pressed the pedestrian crosswalk button. As I stepped onto the road to carefully cross the 4-lane street, a van blew through the crosswalk two lanes ahead of me. I wasn’t at all alarmed or concerned. 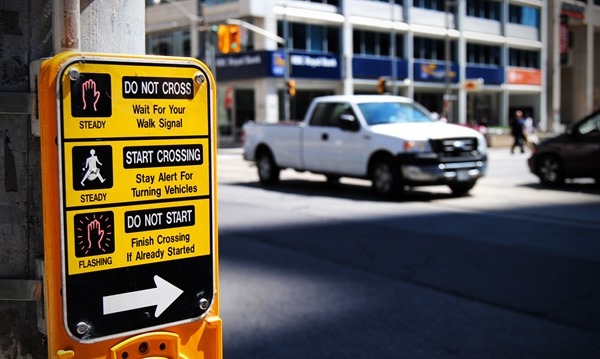 It is common for inattentive drivers to fail to notice the flashing crosswalk lights, so I always prepare myself for at least one driver not stopping at the crosswalk, and I only proceed when it is safe to do so. The last time I crossed at this same crosswalk, an inattentive driver blew through the crosswalk only a metre in front of me. I would most definitely have been run over had I not been paying attention, but I was watching carefully, so I was prepared for it. As the driver flew by that last time, I put both arms out to the side and gave a “WTF” stare in the driver’s direction. But he was too busy playing with his phone to notice almost hitting me. Another driver who watched the incident unfold beeped at the driver, but the driver took no notice, and probably won’t realize his mistake until he actually does run someone over. And when that happens, he will probably tell the police the pedestrian “came out of nowhere”, and will in all likelihood get off without any charges. Today however, I had a guardian angel with me (or rather the Toronto Police Service). Two seconds after the van blew through the intersection this morning, a police officer engaged his siren and chased the van. The officer was not impressed, and stormed up to the window of the van to berate the driver (and hopefully write him a ticket). Ten minutes later I walked out of the pharmacy and looked over at that same crosswalk. There was a family with a stroller walking across the busy street. At the exact moment I looked over, the same police officer stepped on the gas, turned on his siren, and pulled a U-Turn in front of a line-up of stopped cars to chase and pull over another driver for blowing through the crosswalk in front of the family. I could see the officer from a distance scolding the driver and asking for their license & insurance. It was nice to see the traffic police engaging in service that directly helps save the lives of the most vulnerable users on our roads. This did not go unnoticed, and was certainly appreciated by myself, and countless other pedestrians who have been in a similar situation. 38 pedestrians have been killed in Toronto so far this year. 38 preventable, unnecessary deaths – a 10-year high. 38 human beings who are treated as collateral damage to our car culture and sense of entitlement to drive everywhere unimpeded. The beasts are loose on our streets and badly need to be tamed. Thank you Toronto Police Service for taming the beasts this morning.